It was kind of inevitable that if I was handed a complimentary copy of the Daily Mail as I boarded my flight to Berlin that I would end up having to write about it. 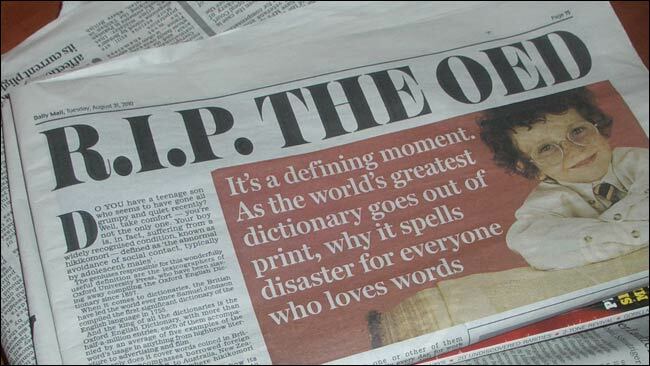 The piece I couldn't bite my blogging tongue about was Harry Mount's dire eulogy for the full printed edition of the Oxford English Dictionary. "A computer is a wonderful thing. But - unlike the combination of the scanning eye, the human mind, 22,000 pages to be opened at random and a clumsy finger fumbling for a single definition - a computer isn't serendipitous"
Computers are not senseless mechanoids inflicting a serendipity-free world upon the human race - they simply carry out instructions they have been given by humans. If you want serendipity, they can be programmed to give you serendipity. For The Guardian alone there is most clipped, Zeitgeist and The Random Guardian. Or browse the Delicious most bookmarked, or Instapaper's 'Most deferred'. Look at the (NSFW and sweary) design pattern of 'WTF should I do this weekend?' or search Google for "Random * generator". All computerised ways of enabling you to discover surprising and delightful content you might not have know you were missing. Let's face it, at the core of modern computing is 'random access memory' after all. By Martin Belam on 31 August 2010. But aren't those all just examples where the user has to think "Today I want something serendipitous" and then has to go and find the 'collected serendipities' pages? Is it really serendipitous if you had to go looking for it? True, but in Harry Mount's amazing world of serendipity you still had to choose to pick up the dictionary, and consciously decide which volume to start with. But there are plenty of ways in an online dictionary that you can mimic that - by showing a list of words that would have been on the same page in print alongside the definition you have searched for, typeahead search suggestions prompting you to click on words you never knew existed, having a random definition of the day on the homepage, or a 'Give me another' button. I don't buy the argument that computers = no serendipity full stop. You just have to build it into the system. If he really thinks there is no serendipity on the web, someone should introduce him to the wikiloop. I definitely agree with paul. serendipity is never searched, it comes along without us knowing it's already on its way to us. Though I believe in serendipity on the web, and it's called "Stumbleupon". Displaying words on the same page? Like the OED does online?